The latest trailer for Goosebumps 2: Haunted Halloween was released last week and many were hoping that Jack Black would finally be announced. However, the trailer did not deliver in that department. Instead, the studio decided to reveal Black's involvement in the sequel in a brand-new 30 second TV spot. Black was seen as a key ingredient to the success of the first film and many thought that he was not going to appear in the sequel because he had not been featured in any of the previous promotional material. In addition to the latest Haunted Halloween trailer release, last week also revealed the initial box office predictions for Goosebumps 2. It was on track to make around $14 million its opening weekend, which is a lot less than the $23.6 million that the first film did upon its debut. The inclusion of Jack Black at this time could be seen as a way to try and get more people into theaters to boost the first weekend box office numbers. It also blows the lid off of a major secret cameo. Back when Goosebumps 2 was first announced, it was revealed that Sony was working on two sequels, one of which had Jack Black involved and another that did not. Since we did not see Black's name attached to the sequel or see him in any of the promotional material, it was thought that the studio went the cheaper route to do it without the actor, who already had scheduling conflicts due to The House with a Clock in Its Walls, which just hit theaters this past Friday and earned the number one spot at the weekend's box office, bringing in more money than expected. This is probably the sole reason we're seeing Jack Black's cameo spoiled early, to get meat in seats. 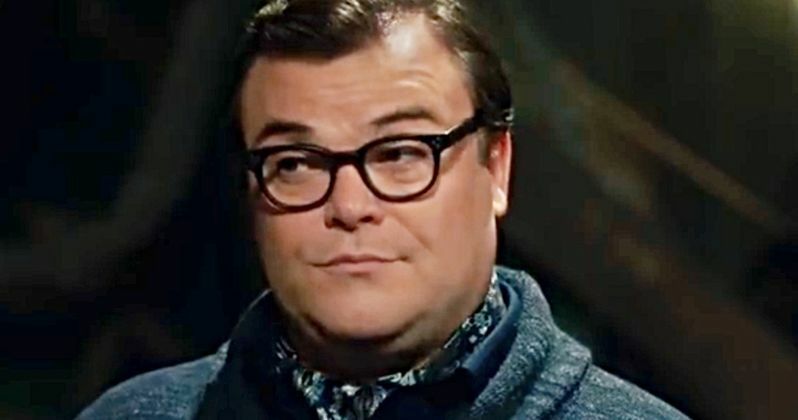 Sony was able to find a way to get Jack Black involved with Goosebumps 2, but it is unclear how much of the movie that he will appear in. From the looks of things, it appears that Jack Black's R.L. Stine shows up at the end to help save the day, which means that he'll more than likely only be in the last portion of the film. Whatever the case may be, this is certainly great news for fans of the first installment who were looking forward to seeing Black return to the series. Now that secret is out, it will be interesting to see how Goosebumps 2 does during its opening weekend compared to the initial box office estimates. The inclusion of Jack Black's R.L. Stine in the latest TV spot was a wise choice, but it would been an even better idea to have had him in the last trailer for the film, which put the focus on the evil Gummy Bears instead. Goosebumps 2 looks like it's going to be even scarier than the first installment, though some have criticized the sequel's trailers for not having the charm of the original. You can judge for yourself and watch the latest TV spot featuring Jack Black below, thanks to the Sony Pictures Entertainment YouTube channel.